Pegazus has always been an anomaly. The band is Australian but sticks with genuine heavy metal. 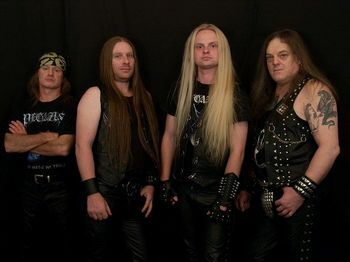 It is obvious that the band has separated from Nuclear Blast Records, which was issuing the group’s records, but musically and sound-wise nothing is amiss. The band is doing just fine, thank-you very much, except the cover couple must have the longest arms in the history of humanity, but hey, here at Metallian Towers we support gays, straights, happy, unhappy, purple, blue and even long-armed people! Pegazus’ predicament has always been that the band is derivative and it consistently shows. There is nothing wrong with bands being inspired - every single band is - but somehow Pegazus cannot shake the imitative shackle. Still, the group is inspired by the best and that is something for which to be thankful. Judas Priest has Metal Gods while Pegazus has Metal Messiah. Coincidentally, or not ehem, both songs begin with similar riffs. Old Skool Metal Dayz has a funny intro, which ones hopes is fabricated, although such a thing could easily exist in the USA. Haunting Me begins slower and has higher pitched vocals. It is reminiscent of early Dream Evil both vocally and musically. Speaking of the vocals, there is a lot of flexibility built into the larynx of Justin Fleming. Eye For An Eye, the next track, again contains vocals different than the track before it. Lo and behold, soon the album features an actual cover version of Judas Priest’s Metal Gods, while End of The World leans grunge somewhat. The extended version of Old Skool... which closes the album features David Shankle and Ross The Boss of Manowar fame and Jeff Watson formerly of Nightranger and is, naturally, laden with guitars - good ones too.